So, What Exactly DO You Eat? | Gourmet B.C. So, What Exactly DO You Eat? Let me preface by saying: I don’t count calories. Ever. I know I just blew your mind. You’re probably thinking, “WTF??!! No, you’re on a diet. You count calories.” Wellllll, no. I don’t. I just don’t care to because it’s way too time consuming for me. I eat when I’m hungry, and usually, I eat what I want to eat. I go through periods when I eat way more fruit than I should and that’s okay. My meals mostly consist of proteins and vegetables, as well as some type of fat (lately, it has been olive oil). Though, on my long days at school, I sometimes have yogurt, nuts, or fruit (or all three). When you look at my meals, you may think, “Holy crap, that’s a lot of vegetables! Are you crazy with those vegetables?” and yes, it’s mainly a vegetable filled plate; those vegetables are always cooked in fat or oil. This is because the feeling of fullness generally disappears on the paleo diet as you cut out carbs. A large consumption of fat is necessary for the feeling of satiety. Fat is not bad for you. Mark from Mark’s Daily Apple notes that it isn’t fat causing atherosclerosis (thickening of the artery walls) but oxidized LDL (the bad cholesterol). Brittany, I’m craving some brussel sprouts. Does my body want protein? Then, I’ll have a protein filled plate. Does it want veggies? Fruit? I don’t deprive my body of what it’s telling me it wants, and I think this is a huge reason this diet has been a success. I’ll eat what I want, thanks! You ain’t the boss of ME! 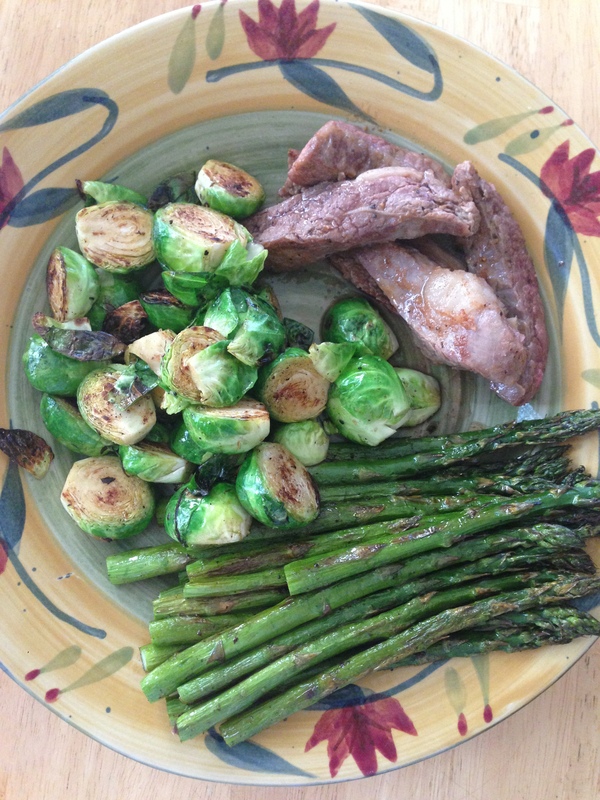 Here is a meal I ate the other day (I’m on a huge brussel sprout kick right now). I was feeling incredibly hungry, so I added a lot of veggies (cooked in olive oil) to my plate. Notice that I didn’t cut the fat off the beef. First of all, I think fat is delicious. Second, it’s great for you, as we’ve established. 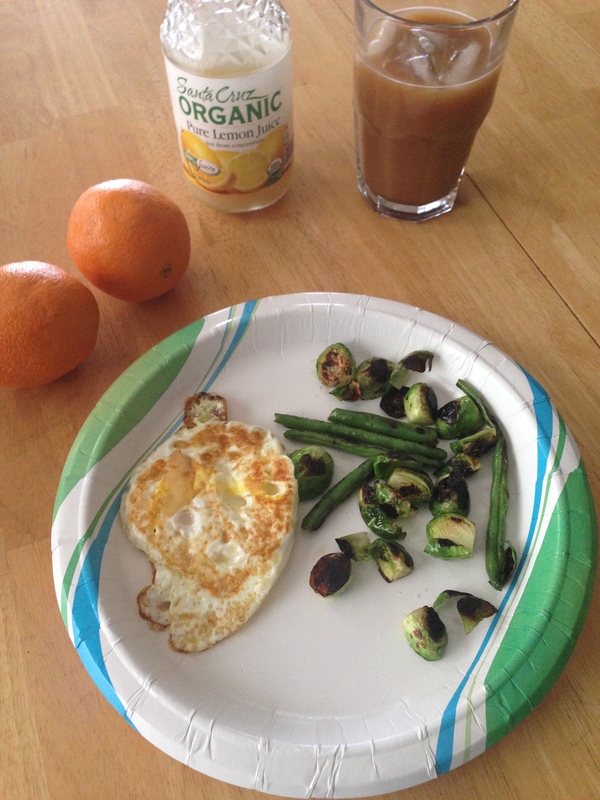 Typical breakfast: eggs, brussel sprouts, green beans, oranges, and coffee. Not pictured: morning smoothie. A typical lunch at home (the salad was a bonus). 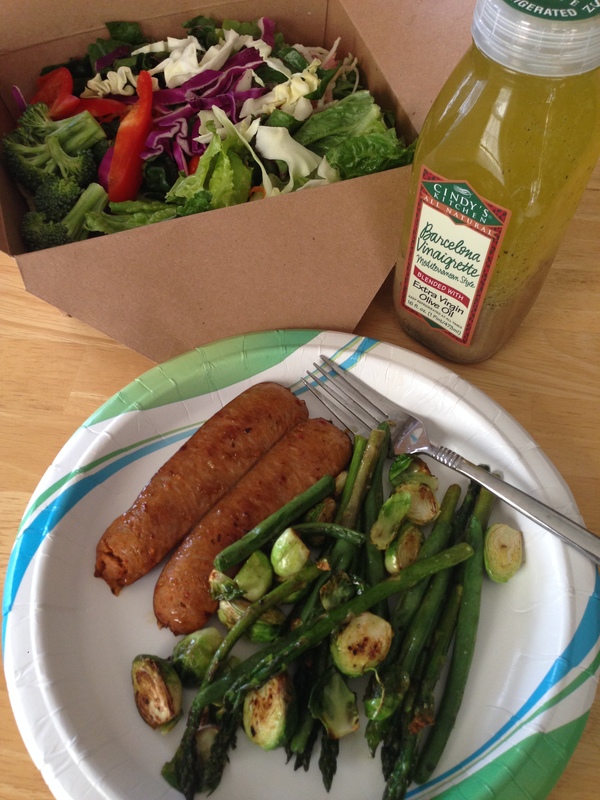 Turkey andouille sausage, brussel sprouts, asparagus, and a raw vegetable salad. At home, I have protein and vegetables for lunch. I had a “bonus” salad because I went to the store. A majority of the salad dressing is made from olive oil. Olive oil is my favorite oil to use because it reduces oxidized LDL (the bad cholesterol) and helps raise HDL (the good cholesterol). It may look like my diet doesn’t vary very much, but it actually does. I’m just on a huge brussel sprout and asparagus kick lately. I’m not perfect; I don’t always have a protein for lunch. Or, I may have a few more brazil nuts than I should. GASP! It all depends on what my body is asking for. Are you afraid of fat? Do you cook with fats or oils? If so, what kind do you use? 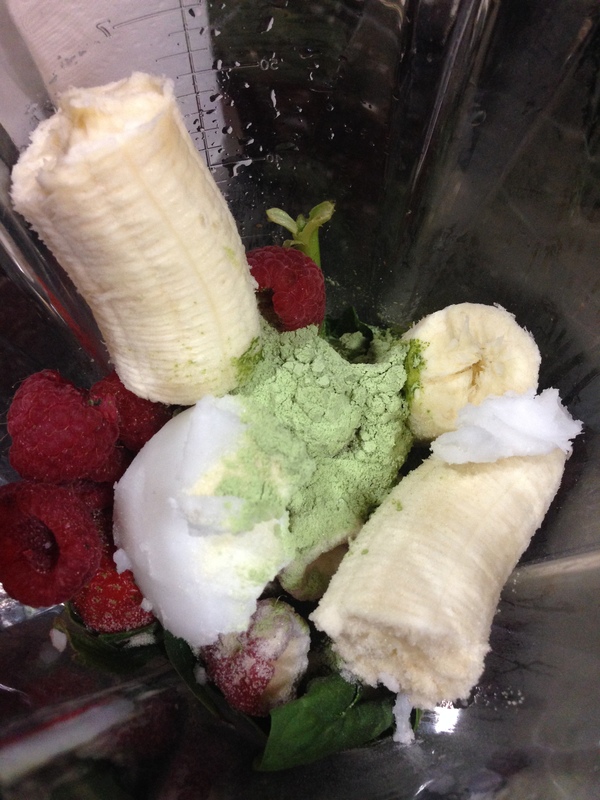 This entry was posted in Information and tagged beef, brussel sprouts, coconut, coconut oil, delicious, fat, fats, food, foodie, grass fed, morevegetablesthanavegetarian, oil, oils, olive oil, paleo, vegetables, whole foods, yummy by Brittany W. Bookmark the permalink. I routinely try to give up bread and pasta, but I can only sustain the meat, veggie, fruit thing for a week or two. I do feel really good about myself for those two weeks, though.